A fundamental issue with Ferrari PU? Inspired by regular TJ13 commenter and occasional author @cavallinorampantef1’s comment on today’s Ferrari piece – TJ13 has done some digging into Italian technical news sources and found some interesting, albeit unverified, content and analysis on the SF90. f1analisitecnica.com has published their take on Ferrari’s apparent lack of pace in Australia, and seem to think that @cavallinorampantef1 could indeed be correct and the issue may lay wholly with the Ferrari power unit. As I mentioned, this is completely unverified, but it does make for interesting reading and a good source of debate. Below is a direct translation using deepl.com software, much better than Google’s version but still does make some interesting grammatical inaccuracies. If you haven’t yet voted for your driver of the weekend, or rated the race (0 to 10), please head over to our poll and make your opinion known. Also, be sure to catch up and re-live the weekend’s action by reading TJ13’s writer @MattPT55 Qualifying and Race reviews. As often happens in Australia and other GPs, the fight for the victory was decided at the start where Valtteri Bottas “burned” his teammate, author of a splendid Pole Position 24 h before. The Finn then built his victory to the sound of fast laps, including the real Fast Lap of the race that allowed him to bring to 26 points earned in this first of twenty-one seasonal appointments. The race was certainly less positive than what we could have expected instead of Lewis Hamilton’s, also because of an unfortunate technical problem, better explained in the analysis of the race that will be published in the next few days on these pages. Given the great competitiveness of the W10, even with this aerodynamic imbalance, the five times Anglo-Caribbean world champion managed to control the excellent return of Max Verstappen and bring home an important second position. Third place and the first ever Honda podium for the Dutchman of the RedBull Team, who started the year as he finished last season, that is with a lot of brains as well as the indisputable heavy foot and talent. A single small smear that perhaps did not allow him to try a very difficult attack on the first Mercedes driver but the race led by Verstappen was very intelligent, from the start where he took no risks. Much more interesting is the F1.5 race with many drivers involved if we think that from the seventh position of Hulkenberg to the eleventh of Gasly, at the end of the race, there are only a little more than 5 seconds. It’s a shame only for the overtaking difficulties that remained intact on a problematic circuit like the Australian one. But on this, we will dwell later on. Many will wonder why we are talking about F1.5; simply because little has changed since last year with only Kevin Magnussen, sixth place, not to be lapped, even if very little. But let’s go into more detail of this first analysis 2019. In this article I want to focus only on Ferrari, the team that certainly has most disappointed in Australia. The SF90 was in fact given as a favourite on the eve of the race for what was good shown during the eight days of testing and even the most pessimistic analysts could not put the SF90 as a third force in the first round of the season. It was right, as written on these pages, especially after the last two really positive days of testing, not to underestimate Mercedes, but to imagine a Ferrari so struggling in Australia was really unthinkable. Even in Ferrari itself they had the same thought. At Maranello they knew they couldn’t be at the top of their form because of some too many reliability problems on which they are working but not such as to bring the SF90s to 8 tenths of an average in qualifying and more than 50 seconds in the race. In Australia we didn’t see the SF90 that Binotto & Co expected, the one that according to their simulations should have been 3 tenths of a second from the W10 in qualifying and then play it in the race. What didn’t work in Melbourne? More factors for sure. Focusing on the first two days of the weekend, and leaving aside the problems at the Power Unit that led to the use in Australia of less pushed maps in order not to compromise the reliability (it was already planned, at the beginning of the weekend), certainly what did not work was the basic setup studied in the simulator. A more unloaded setup than usual, the result of a compromise to avoid a lower thrust of the Power Unit that did not give the desired results on the track. Both Vettel and Leclerc had to fight both on Friday and Saturday with a very unstable front end that caused a lot of understeer not only at the entrance but especially in the middle of the curve. Even with the setup changes planned in Australia and tested at the Maranello simulator by Wehrlein between Friday and Saturday, there were, unfortunately, no major steps forward. The result was an opaque but not very negative qualification considering Vettel’s third position. A SF90 that took 7 tenths of a second place from Hamilton’s Pole, of which 2 tenths on the few straights of Albert Park and 5 tenths in the corners. If last year the biggest problems we had in Australia were to be found on the rear of the SF71H, then corrected very well in Bahrain thanks to a new background specification, in this season 2019 the problems are to be found at the front but, as understood, they would result from the compromise necessary to not lose too much ground on the straight because of a power unit unfortunately overwhelmed. Therefore the Power Unit would be the real current problem of the Italian Team, as anticipated in the morning on Saturday. Fixed the problems of reliability to the drive unit, consequently you would have more possibilities of settings to fix a front end also very aggressive (the front wing so unloaded on the sides is the right solution?). A Power Unit that is creating some too many problems also on the other Ferrari engines, Haas in primis (in the race the use was very cautious), less on Alfa Romeo that has however different accessory components compared to the other two Teams. Both the American and Alfa teams had problems, fortunately solvable, with the hybrid part of the Grosjean and Raikkonen Power Units on Saturday. Going into more detail, although we are still looking for confirmations, it seems that the main problem had by Vettel yesterday is to be found between the turbocharger group (in Barcelona were highlighted turbo problems) and the hybrid part of the Power Unit. The two macro parts are obviously connected, both in physical terms and in terms of operation. Decreasing the supercharging pressure not only has a lower power from the endothermic but also a strong repercussion on the recovery of electrical energy through MGU-H with consequent problems especially in the second parts of the straights. Less energy, which also has an impact on fuel consumption. A bit like it happened to Honda with the first specifications of its Power Units, thirsty for gasoline not so much for a poor endothermic but for the hybrid part not so efficient. And in fact in the second half of yesterday’s race Vettel had to do a lot of fuel saving with the strategy of the Lift and Coast, that is to say travel the last parts of the straight without accelerating. In addition, yesterday it was interesting to see how Vettel used the gear changes in the middle and final part of the race. Not so much the use of the eighth gear on the main line, which depends very much on how you use the PU (in Engine 1 was inserted, with the most conservative mapping no), at least in Melbourne, but the keeping high the number of laps of the endothermic in many curves of the track to recover more energy from the MGU-H generator. What many people are wondering is: what happened to the excellent Ferrari Power Unit, the extra weapon of the red one in the past season? The 2019 car, as well as the 2018 from which it derives, has the important need to be supported by a significant amount of horsepower, under penalty of getting rid of those chassis problems never solved in Maranello or a project that has improved in terms of aerodynamic efficiency but that still does not excel at the level of RedBull or better Mercedes. The need to use rear wings (the aerodynamic element that generates more resistance on current cars) always very loaded, coupled with a macro concept aerodynamic medium / high rake, generate important levels of drag forward that can certainly create problems if the Power Unit is not up to the task. A bit like what happened at RedBull last season where the too short deck put the excellent chassis of the RB14 in trouble on many tracks. 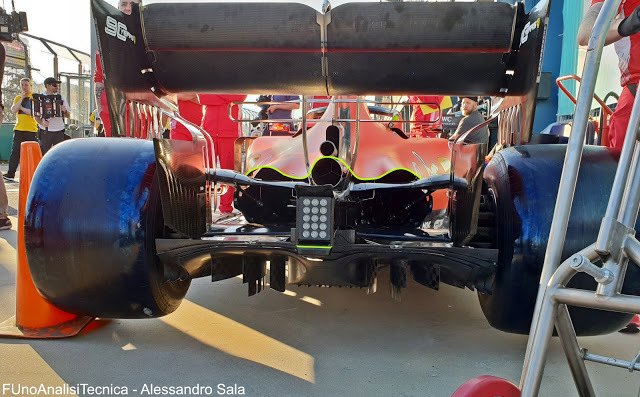 At Maranello, at least officially, the mouths remain sewn (unofficially less…), continuing to deny any problem with the drive unit mounted on the SF90s. Communication understandable if the solution is being defined and limited to the first appointment of the season, much less if the problem could reoccur in the next races that already know of crucial appointments for a Ferrari that has never started so badly in the hybrid era of a world championship. This article is from Cristiano Sponton’s FunoAnalisitecnica, he has, in my eyes, the best Italian tech site. One Italian commentator I correspond with on twitter tells me he’ll have have an explanation for the issues with the Ferrari PU later today. I’ll repost it when it comes out. But what he has told me so far is the main issue is with the MGU-H system which was redesigned / modified during the winter. Also Ferrari discovered the engine was overheating during the practice sessions which resulted in minor changes in the bodywork. maybe a little more than minor. That looks like a much larger opening to let the hot air out. 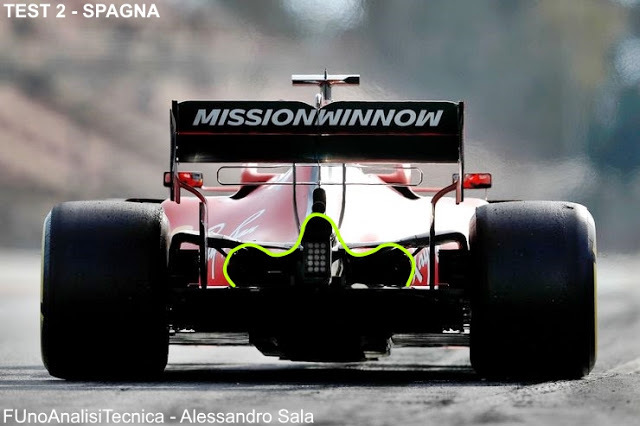 The Italian twitter commentator I know tells me that Alfa are using an earlier version of the Ferrari PU which is why they didn’t have the issues which Ferrari and as he also told me, Haas did. Alternate theory: It’s the missing Mission Winnow stickers. Ferrari had a worst start and season in 2014. Which was in the hybrid era.